Well, things have been really lemony around here lately, haven’t they? I blame that on summer, some super delicious lemons I picked up, and all the recent discussions about lemon desserts on IG… But not complaining. I love citrus desserts in all kinds, shapes, and sizes. 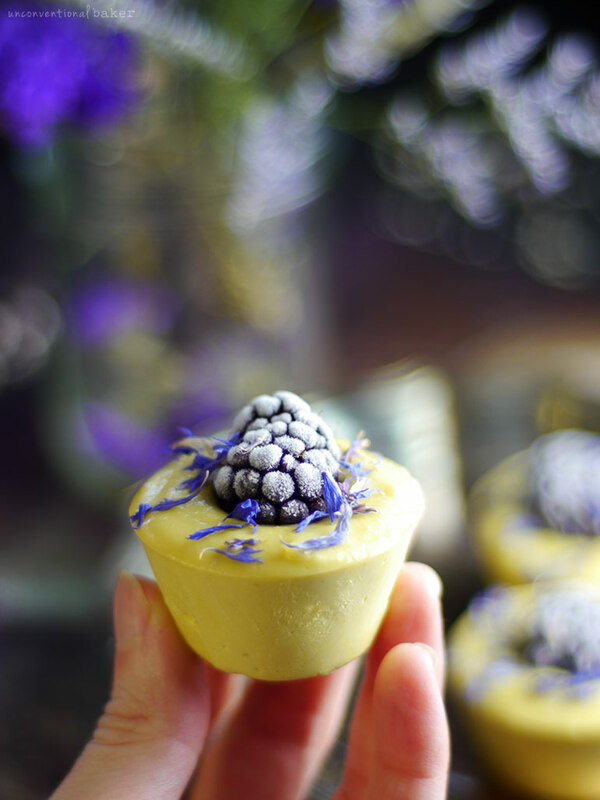 These little blackberry lemon cheesecakes came about when I felt like just having a simple treat to have on hand, as opposed to a whole cake production… Somehow they still managed to look rather stately though despite my original low key intentions ? I think there’s just something really beautiful about a purple yellow combination. I remember when I was a child my aunt gifted me some purple and yellow tulips. I’ve never seen a purple tulip before and I thought it was the most beautiful color combination I have ever seen. I remember wondering why I never though to combine those colors up until then. Evidently that memory still has a strong hold in my mind because anything yellow and purple always catches my attention… And evidently my color and pattern obsession had earlier beginnings than I recalled up until writing this now… Interesting! 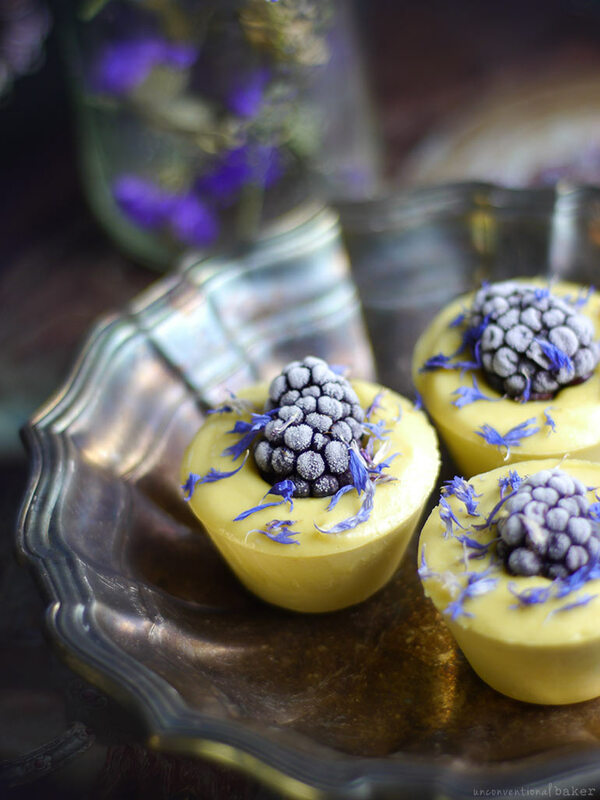 But it’s not just the colors that make this combo works — blackberries and lemon have the perfect balance of sweetness and tartness and make a perfect creamy and refreshing dessert pairing. But of course this works a treat with other berries instead too — raspberries and blueberries are both absolutely delicious in this recipe. As I mentioned up top, I wanted to make minis as opposed to a whole large cake, and my intention was just to have these quick bites on hand in the freezer. I therefore didn’t bother making a crust, though if you wanted to, that could be easily achieved by using any of my raw cheesecake crusts. Without the crust they have a bit more of a light feel to me — just soft and creamy, almost ice cream-like though definitively cheesecakey in flavor. P.S. 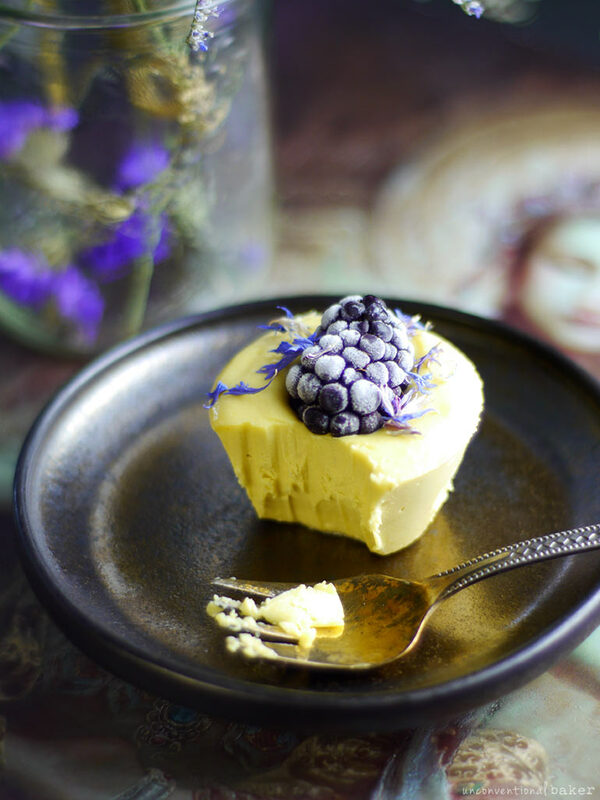 For tips and tricks on making raw cheesecakes like a pro, see my book Unconventional Treats. Make sure all ingredients are at room temp. Blend all cheesecake ingredients until completely smooth in a power blender. Divide the mixture between 7-8 silicone mini muffin molds (this is the mold I use, and I place it inside a regular mini muffin pan for stability. Can also use individual mini silicone muffin liners instead). Press a blackberry into the top of each cake. Sprinkle with cornflower petals if desired. Freeze for 5 hours or overnight, the pop out of the mold and enjoy. Keep leftovers frozen. 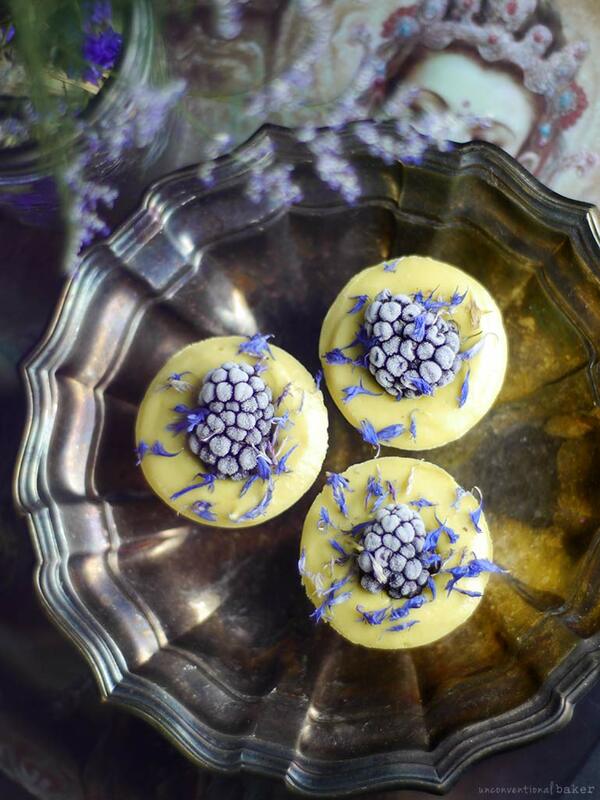 Disclaimer: this post contains affiliate links to the dried blue cornflower petals and silicone mold / liners I used for this recipe. 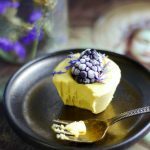 I would like to try your raw blackberry lemon cheesecake bites, but have a question about the lemon extract. they usually taste so alcoholic, I´m wondering what to use instead. Or do you have a suggestion for an intensive, natural, lemony extract (or oil) suitable for children too? Or one, that I could make myself? Thank you for the awesome recipes, as a mom I really appreciate it! Sounds delicious and I have a TON of lemons I’m trying to not have go to waste right now…I have everything basically except the silicone molds…can I put them in a non stick muffin baking tin without? Should I use the cupcake papers? Thoughts anyone? ? Hey Lindsey. If you use a regular muffin tin you’ll have a hard time getting them out, but there’s a trick. If you make a thin-ish parchment paper strip and put it in along the base and sides (like this) it could work. You could also improvise with parchment parchment paper lining that creates tall edges (like this). Regular cupcake liners could work fine too, provided they are not too thin and that you don’t fill them all the way up — you basically need something to gently tug on to extract the cupcakes. You can also just make this in a square larger container that’s lined with parchment and simply cut into squares once it’s set. Found your site while searching for “individual” cheesecake recipes. You are indeed talented and are to be commended for helping to serve an extremely sensitive community out here in the fringes. Thanks to you from another dedicated baker/cook. Age sort of slows me down now, I’m not nearly as active in the kitchen as I was years ago, I made my own bread, etc., but my heart’s still in it all. Interestingly though, no one seemed to have commented on your talent for food photography. Great job, wish I could visit, see your props, etc., to talk food and food photography. Kudos, and good show on all counts. Thank you once again and I hope your heart stays in it: baking therapy, creative outlet, time for self, something to share with others — whatever people name it, I think it has a lot to offer. 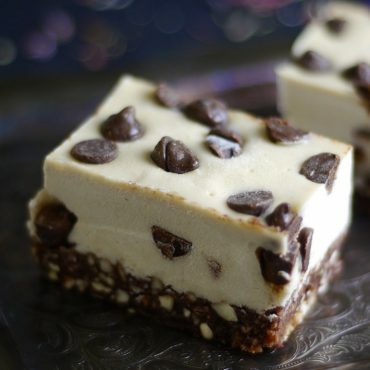 There’s a standard raw cake / dessert procedure of working with raw nuts that are pre-soaked. To pre-soak them you need to soak them in room temp water for 4 hours (to get the most nutritional benefits of them and to keep the recipe raw). Alternatively, if you don’t need the recipe to keep “Raw”, you can also do a quick soak if you prefer by covering them in freshly boiled water and letting them sit for 15 mins. In both cases the objective is to re-hydrate, soften, and plump up the nuts so that they blend into a smooth consistency. And in both cases you strain and discard the water at the end and just use the nuts. Hi Judith, it’s a raw cheesecake, which is a type of cake made with cashews and no-dairy. The colours are gorgeous, and when I saw the little infusion of turmeric in the recipe, my mind just clicked! It’s a brilliant idea for achieving that beautiful lemony hue, and one I will definitely put to use in the future. Amazing as usual! But what kind of blender do you use for such a small quantity of cashews??? Thanks Valentina. I use my Vitamix. This is the smallest amount I’d say that can still be turned into a smooth mixture. If the nuts are soaked enough and the recipe has enough liquid have no issues. Cashews soaked in what? Water, milk… and were is the “enough liquid” coming from? There’s a standard raw cake procedure of working with raw nuts that are pre-soaked. To pre-soak them you need to soak them in room temp water for 4 hours (to get the most nutritional benefits of them and to keep the recipe raw). You can also do a quick soak if you prefer by covering them in freshly boiled water and letting them sit for 15 mins. In both cases the objective is to re-hydrate, soften, and plump up the nuts so that they blend into a smooth consistency. And in both cases you strain and discard the water at the end and just use the nuts. I’m not sure what you mean by “enough liquid”? I don’t see that in the directions..
Ah, I see. I meant if the recipe naturally has enough liquid, things should blend well in the blender. So in this recipe, the coconut oil, agave, and lemon juice serve as the liquid. 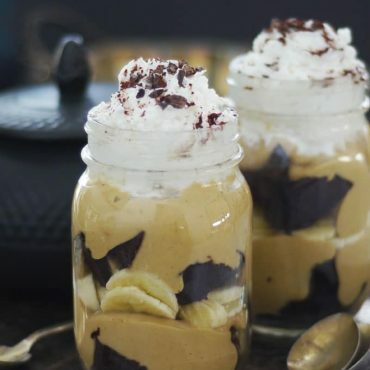 In response to Valentina again, as well, while I’m at now… just wanted to add I realized recently that some people are using the newer low profile Vitamix, which unfortunately doesn’t do well with small batch recipes like this. So if that’s what you’re using, I recommend doubling the recipe so that the blending goes smoothly. I use an older tall model Vitamix and these recipes blend great for me.